“(1) The Holy Father today received in audience Cardinal Christoph Schonborn O.P., archbishop of Vienna and president of the Austrian Episcopal Conference. The cardinal had asked to meet the Supreme Pontiff personally in order to report on the current situation of the Church in Austria. In particular, Cardinal Schonborn wished to clarify the exact meaning of his recent declarations concerning some aspects of current ecclesiastical discipline, and certain of his judgements regarding positions adopted by the Secretariat of State – and in particular by the then Secretary of State of Pope John Paul II – concerning the late Cardinal Hans Hermann Groer, archbishop of Vienna from 1986 to 1995. “(2) Cardinal Angelo Sodano, dean of the College of Cardinals, and Cardinal Secretary of State Tarcisio Bertone S.D.B. were subsequently invited to join the meeting. “In the second part of the audience certain widespread misunderstandings were clarified and resolved, misunderstandings deriving partly from certain statements of Cardinal Christoph Schonborn, who expressed his displeasure at the interpretations given to his words. “(a) It must be reiterated that, in the Church, when accusations are made against a cardinal, competency falls exclusively to the Pope; other parties may have a consultative function, while always maintaining due respect for persons. “(b) The word ‘chiacchiericcio’ (gossip) was erroneously interpreted as disrespectful to the victims of sexual abuse, towards whom Cardinal Angelo Sodano nourishes the same feelings of compassion, and of condemnation of evil, as expressed on various occasions by the Holy Father. That word, pronounced during his Easter address to Pope Benedict XVI, was taken literally from the pontifical homily of Palm Sunday and referred to the “courage that does not let itself be intimidated by the gossip of prevalent opinions”. “(3) The Holy Father, recalling with great affection his own pastoral trip to Austria, via Cardinal Christoph Schonborn sends his greetings and encouragement to the Church in Austria, and to her pastors, entrusting the journey to renewed ecclesial communion to the celestial protection of the Blessed Virgin, so venerated at Mariazell”. “The Viennese Archbishop and chairman of the bishops’ conference personally informed Pope Benedict XVI about the ecclesial developments of the last months. Several “misunderstandings” were cleared in conversation with Cardinals Sodano and Bertone. 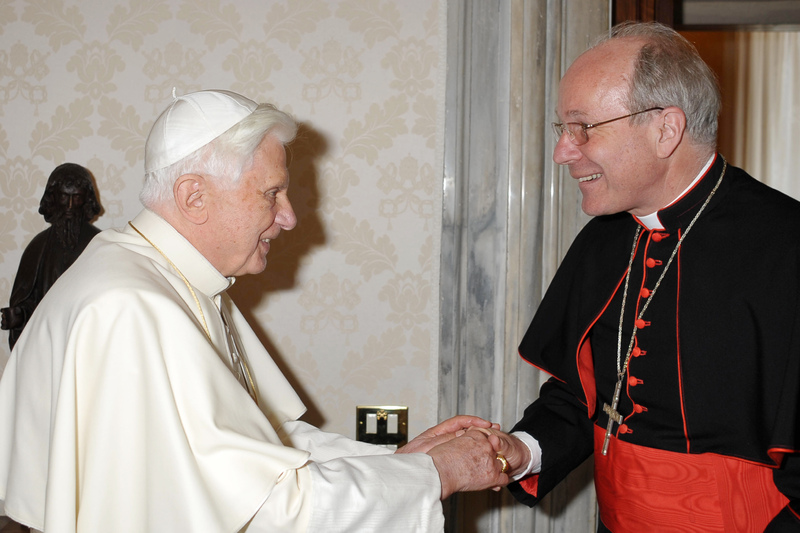 Cardinal Christoph Schoenborn reported to Pope Benedict XVI about the current situation of the Church in Austria on Monday, June 28, 2010. The archbishop of Vienna and the chairman of the Austrian bishops’ conference requested to report to the Pope personally about the developments of the past months. At the same time the Cardinal also wanted to outline the “exact significance” of a number of his statements to questions of Church discipline and to aspects of the handling of the Papal secretary of state with reference to “Causa Groer”. Meanwhile Rocco Palmo has more background on Whispers in the Loggia and Fr Zuhlsdorf over at What Does The Prayer Really Say? offers his analysis.